On favorite things about the neighborhood: People in Davis are really friendly. Our friends, who just moved here from Maryland, joke that the various grocery stores are having a contest to see who can be the friendliest. (As in, “Please let me help you get your bags out to your car!”) And from March to October, the Farmer’s Market holds a Wednesday picnic night with live music and pony rides. Everyone comes out to sit on the grass. 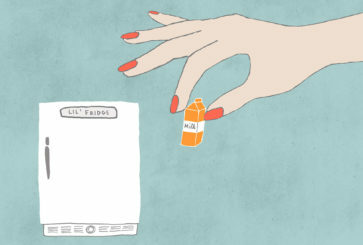 On how to maintain a (light-colored!) home with small children: We try to be realistic about messes and spills (they’re going to happen). I also tried to choose durable furniture. The leather couch actually looks better with wear, and spills wipe right up. The white plastic chairs are fantastic, too—you can clean crayon marks right off. And the cork floors are super forgiving! Leather sofa: Restoration Hardware. 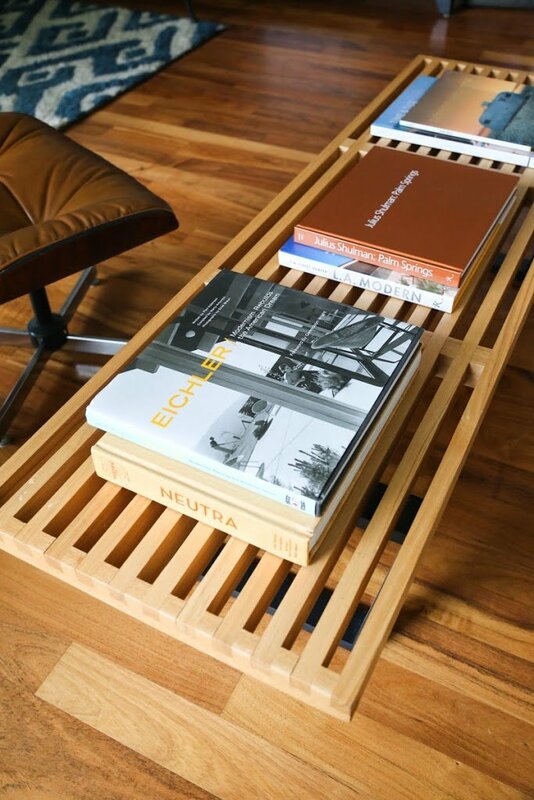 Coffee table: Custom, from Bali. Black and blue pillows: Haus Interior. 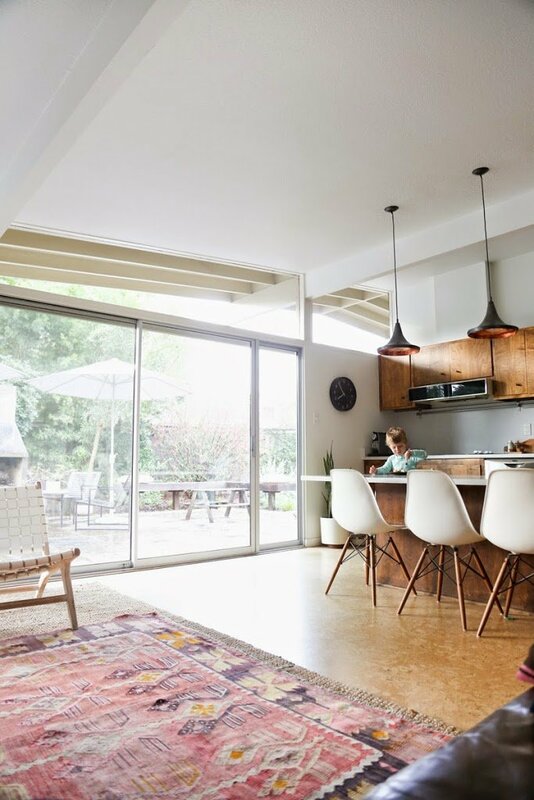 Kilim rug: Vintage, from Scout Living. Floor lamp: Room and Board. Woven white chairs: Custom, from Bali (similar here). Pouf: purchased in Bali. White chairs at counter: Eames, from DWR. High chair: Stokke. Pendant lights: Purchased in Bali. On favorite places to shop: We do most of our shopping at Room and Board, Ikea, West Elm, Target and the odd flea market. Design Within Reach is a favorite source of inspiration. When we were in New York, I loved looking around ABC Carpet & Home—which felt similarly aspirational. 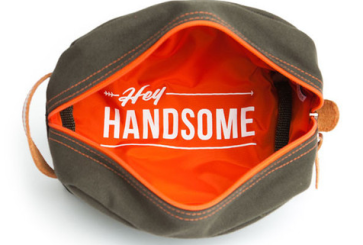 I’m always on the lookout for good design, be it on Etsy or Amazon, or at a traveling market like Renegade. Sofa: Jonathan Adler. Coffee table: Nelson Bench, from the Alameda Flea (similar here). Planters: Case Study by Modernica. Dining table: Room and Board. 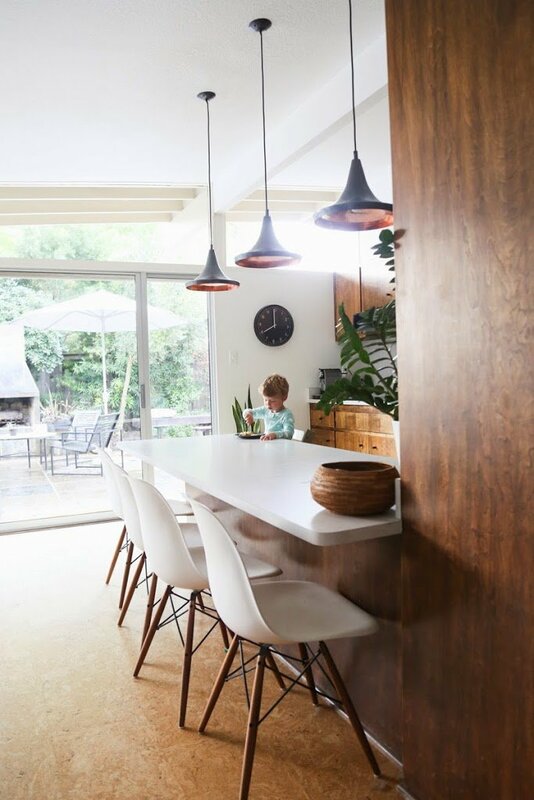 Dining chairs: DWR. Rug: Room and Board. Chandeliers: West Elm. 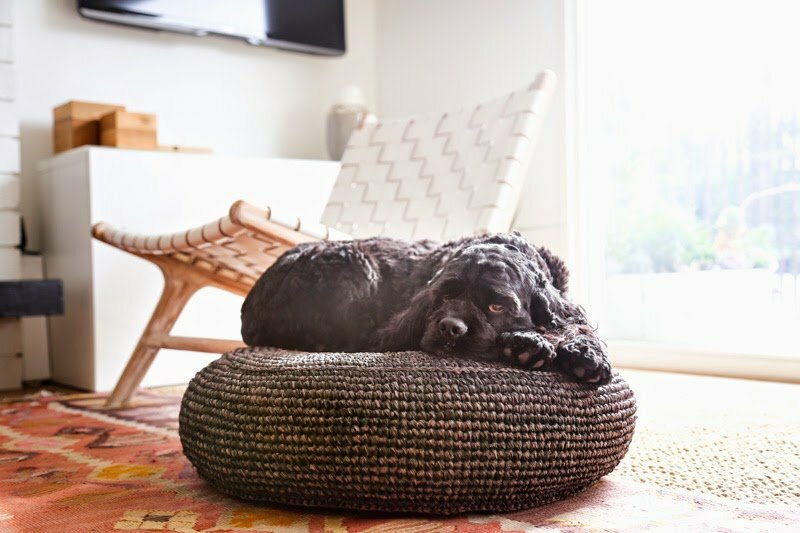 Brown lounger: vintage Eames, from Scout Living. On spending time in the yard: I love eating dinner outside after a hot day, when it finally cools down and the light grows golden. Lately, I’ve been sitting outside with baby Skyler while our toddler Hudson chases the dog and looks for bugs. He loves to bring me things he finds—this winter, bringing in the Meyer lemons and making lemonade was one of his favorite activities. 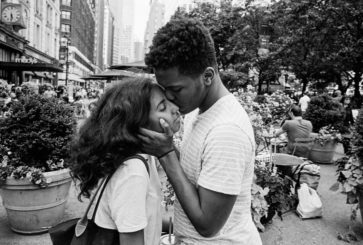 On NYC vs. Davis: Since moving here, I’ve become more content to stay in. 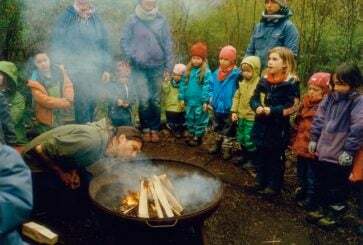 A weekend in our yard feels like an activity, whereas a weekend spent indoors in New York would have felt like a wasted opportunity. I do miss living among so many great restaurants, but the upside is that we focus more on the produce we buy at the farmers’ markets. Ultimately, when we first moved here, we anticipated driving to San Francisco or Berkeley at least once or twice a month to get our city-fix. I’m so glad they’re nearby, but I don’t find myself craving those excursions to the degree I thought I would. 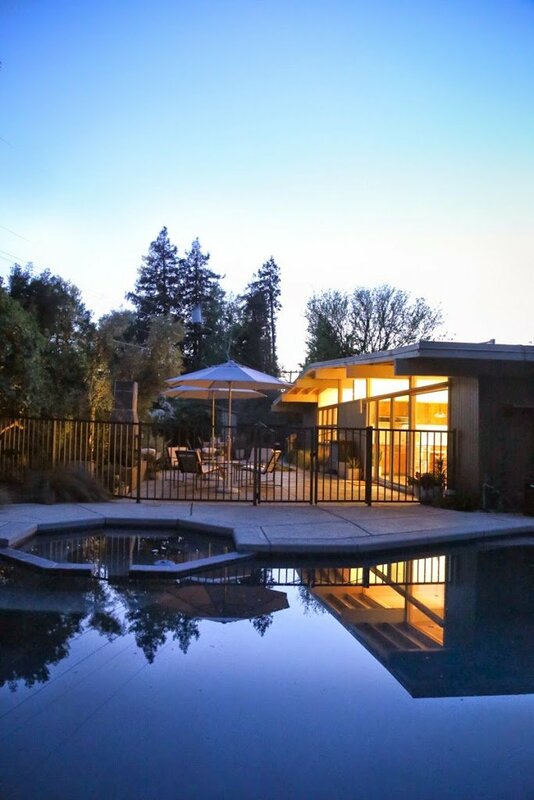 On throwing pool parties: There are always a few 100-degree days in Davis, and most weekends last summer involved having friends over to swim and sit in the sun. My favorites were when we would let the afternoon roll into evening with a simple grilled meal and bowls full of grapes with little hands to grab. On destination shopping: We had been looking at outdoor furniture in New York, and we realized nearly everything we liked was made in Indonesia. We were about to go on a month-long family vacation to Bali, from where we would fly to our new home in California, so it seemed only natural (and kind of awesome) to look for furniture there. We had most of our outdoor furniture, and some indoor furniture, made in Bali and it arrived by freight a few months later. Wooden table and chairs: Custom, from Bali. Chairs with cushions: Room and Board. Umbrellas: Room and Board. On that amazing wood headboard: We can never move! It weighs a ton! We bought it on our vacation in Bali. There were a few shops that sold giant slabs of a fast-growing hardwood called Saur, and we went to each one trying to imagine how we could somehow incorporate something into our home. Once we decided on a headboard, we had to take a bit of a risk that we could fit it into our house. Thank goodness it worked out—or the seven guys who helped bring it inside would have killed us! On morning rituals: Hudson has the OK to Wake! clock, which lets him know when it’s okay to start calling for us (he’s always the first one up!). Aron goes to get him dressed while I feed Skyler or catch a few more minutes of sleep. Then Hudson comes running into our room, books in hand, enthusiastically shouting “Good morning, Mommy! I got book!” while crawling into bed beside me. 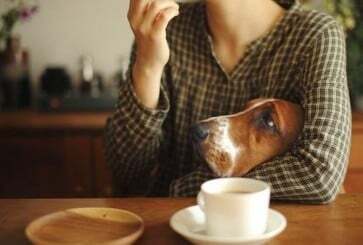 I’ll never get used to waking up early every day, but I do love those first morning hugs and kisses. …and nighttime rituals: Before Skyler, I would have said my ideal night would be to take a few moments to relish the calm and quiet, and then bring the baby-monitor to the jacuzzi to look up at the stars or spread out on the couch and start whatever show we’re binge-watching at that moment. But since Skyler was born, ‘calm and quiet’ has felt pretty elusive! Arc lamp: CB2. Bed: Ikea. Jute baskets: Target (similar here). On honoring a piece of the past: Back in New York, Hudson slept in a closet—with a mini crib, mobile and wall of graphic animal wallpaper. When we moved, the wallpaper stayed behind, but I kept some of the leftover roll to frame in Hudson’s new room to make him feel at home. On choosing toys: Like many parents, I started out hoping my kids would have only well-designed toys of the all-wood, hand-knit variety. (In the words of Tina Fey, those “beautiful wooden educational toys that kids love…if there are absolutely no other toys around and they have never seen television.”) But it turns out I’m generally happy to encourage anything that he gets excited about and that fosters his curiosity. Though I admit: I sometimes remove the batteries! 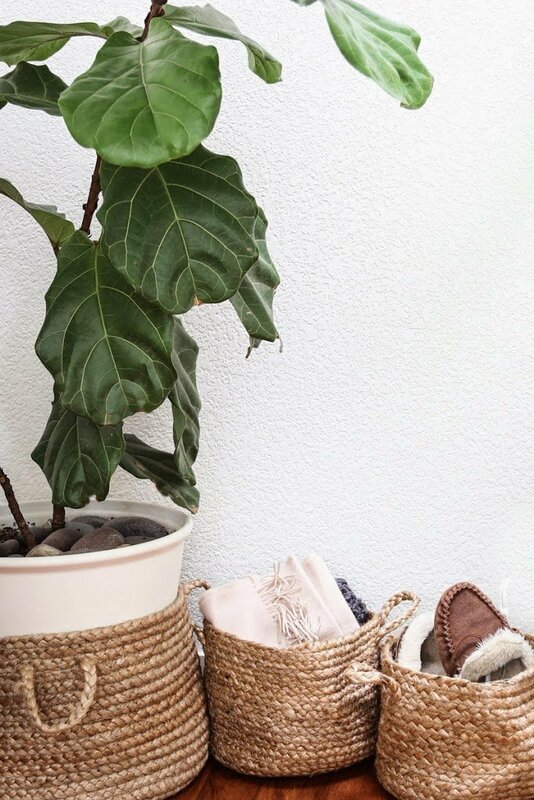 On tips for keeping things neat and organized: Purge often, clean with a basket in hand, and give everything a place. The last one seems obvious, but it wasn’t apparent to me until I found myself cleaning up Hudson’s room after raucous play dates how much that third bit helps. He has all of these bins and their contents are fairly straightforward (stuffed animals in one, trains in one, everything else small in one). It’s ten times easier to put his room back together now because I don’t have to spend time thinking about where everything should go. Teepee: Etsy (similar here and here). Storage shelving and baskets: Ikea. Rug: Pottery Barn via Overstock.com. Crib: Walmart. Multi-colored jute stools: Target. 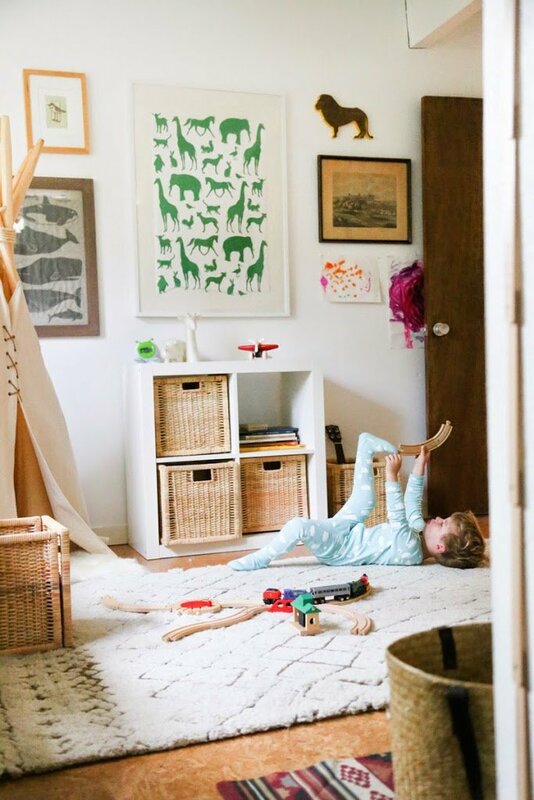 On decorating kids’ rooms: I tried to start with neutral elements and avoid a single theme. I figure I’ll let them steer that course. Hudson’s room has one wall covered in cork and then painted white. 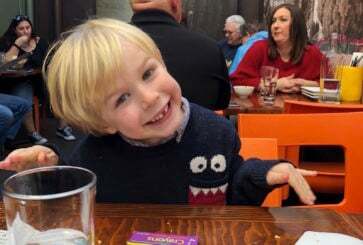 The idea is that we can easily add his own artwork and, eventually, let him rotate in images of things that interest him—whether that be dinosaurs, rockets or a rock band. 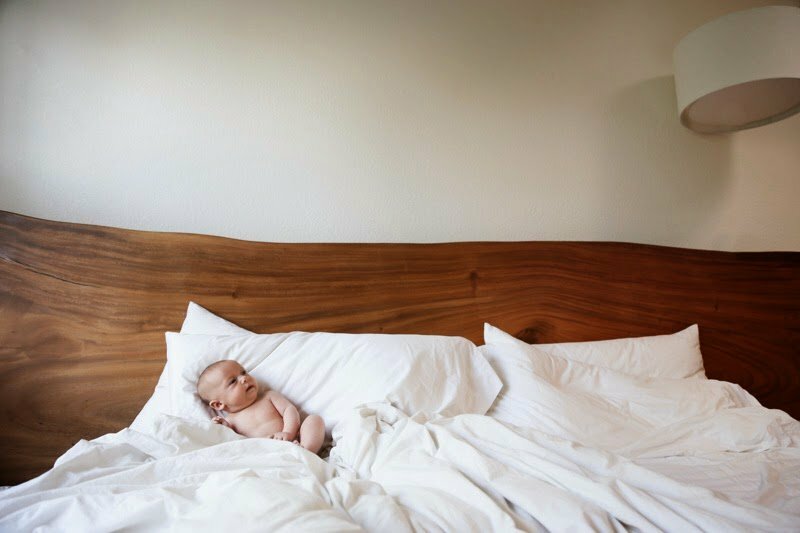 On cozy moments with a newborn: There was a TED talk in which Alison Gopnik talked about how babies have a hard time not paying attention to all the stimuli around them. I always think about that. When I rock Skyler to sleep, I often find myself stroking her forehead to help her learn to just close her eyes. 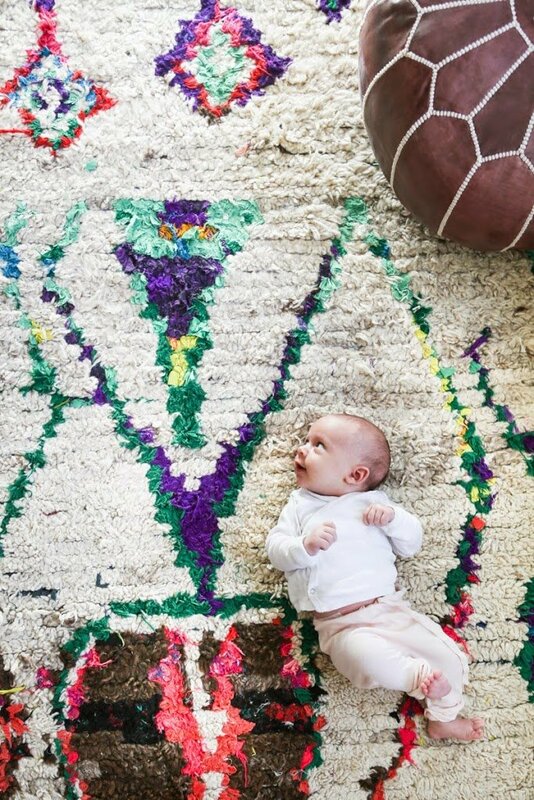 Rug: Vintage, found on Etsy. Pouf: Rose Bowl flea market. Crib: Ikea. 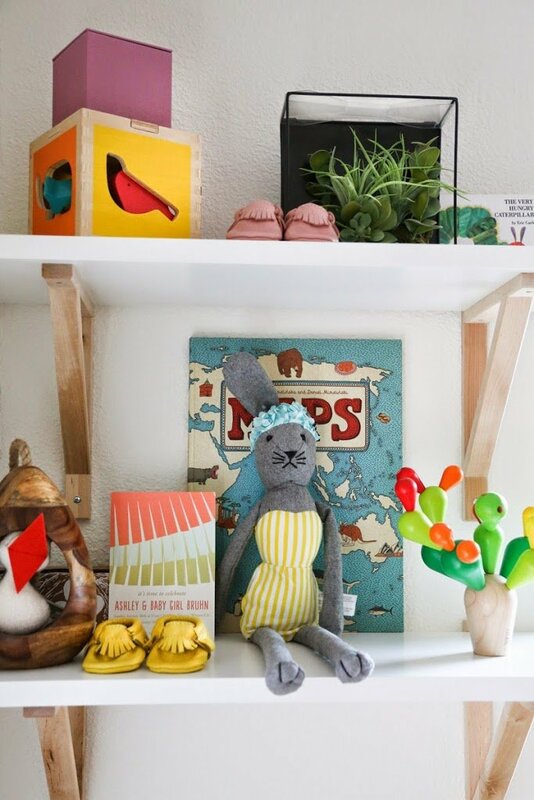 Toys: Anthropologie, Janod and PlanToys. Moccasins: Freshly Picked. The dreamcatchers were made by a friend for Ashley’s baby shower. P.S. 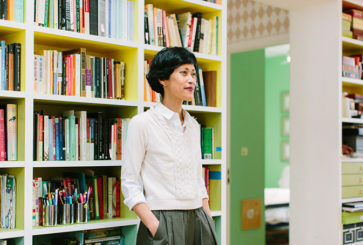 A Los Angeles home, a New York City apartment, and a tiny San Francisco apartment. I love your house! We live in Chico and are about to remodel our mid 1970’s “Eichler clone” house. I am thinking of doing cork floors. Yours look wonderful. If you put them in, can you tell me the brand/type? I just came across this and was hoping to get the artist information from the beach scene painting above the sofa? 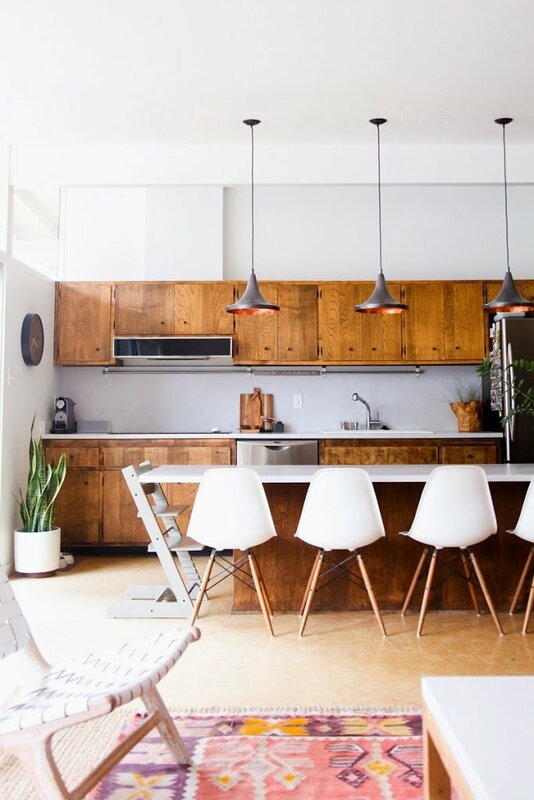 –Kitchen counters and backsplash are both the original 1964 material—laminate? Not 100% sure, but we haven’t updated. One day I hope to go with an all-white corian or cesar-stone. –Erin: Chad DeMasi in Davis was our agent. But we actually found it using the Multiple Listing Source and contacted the selling agent directly. Thanks again, everyone! And thank you for sharing, Joanna! Would love to know about the cork flooring? Do you know the color and the source? Just what we are looking for! 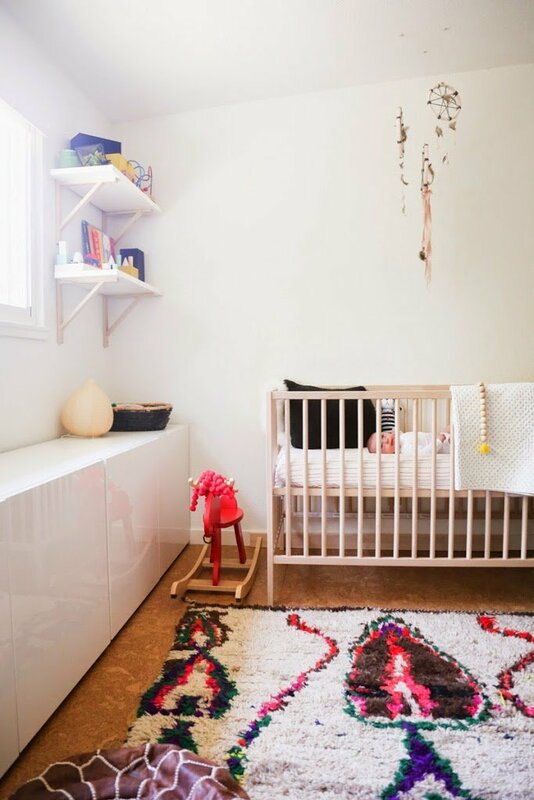 Those nursery shelves are from Ikea and very affordable! Do you have a backsplash in the kitchen? If yes… What material? And what are the counter tops? Absolutely lovely home… Redoing my atomic ranch and want to keep the vibe like yours. Thanks in advance ? Hey there!! Wowzers this house is pretty darn great. Is there anyway she can give us the real estate agency she went with? Or did she use zillow? We’re looking to relocate from the bay area to someplace where we can actually buy a house for under a million zillion dollars. i am in love with the cowboy photograph over the dining table!!! Where is it from? Please!!! OMG, ME TOO!! I must find this print! 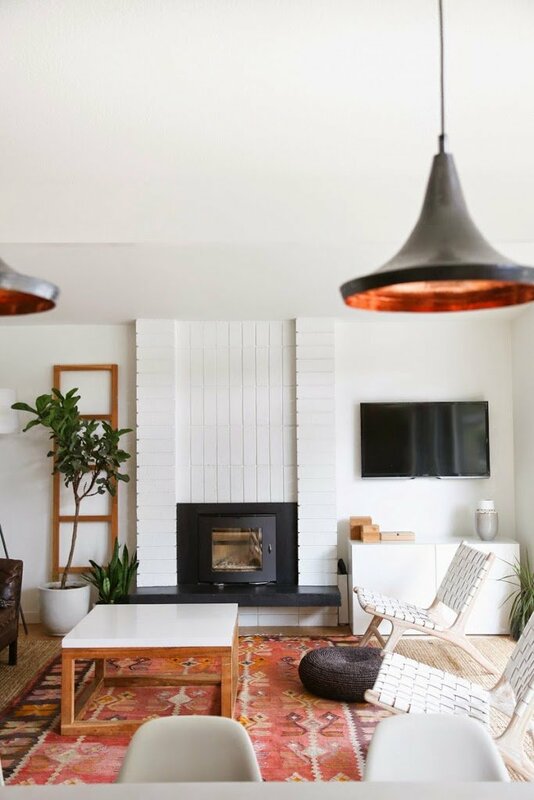 What is the paint color on the walls in the living room? The house is beautiful! Well I was just sitting here you know, obsessively pinning the photos of the back yard, thinking “this looks a lot like our vegetation!” Little did I know this home is ten minutes from where we live! Love everything about it. It’s the perfect Northern California home. I was wondering where the cork flooring came from? And the color? i’ve been searching for reviews of the restoration hardware sorensen sofa (especially regarding comfort due to the height of the seat back), to no avail! how do you like yours? both you and your husband seem to be tall, do either of you regret the purchase? is the sofa more of a showpiece rather than a comfy lounger? may i ask which color and leather type yours is? thank you! Would love to know where they bought the large black and white print above the brown leather sofa in the tv room! 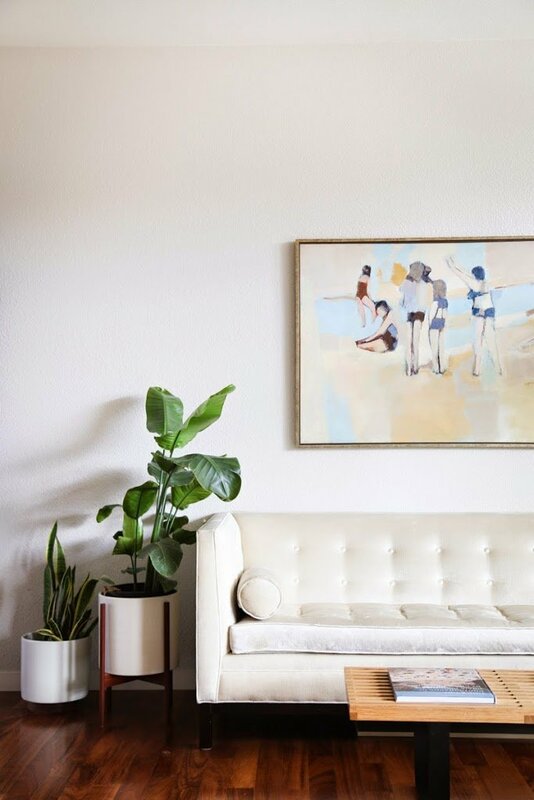 Where is your large art piece in the dining room from? The laquer cabinets in the nursery are from Ikea (Besta with gloss doors). The table and stools in my son’s room are Ikea and Target, respectively. And the clock in the kitchen is… um… Ikea also. Beautiful style!! Would you be able to tell me where your clock hanging in the kitchen is from? AMAZING house! 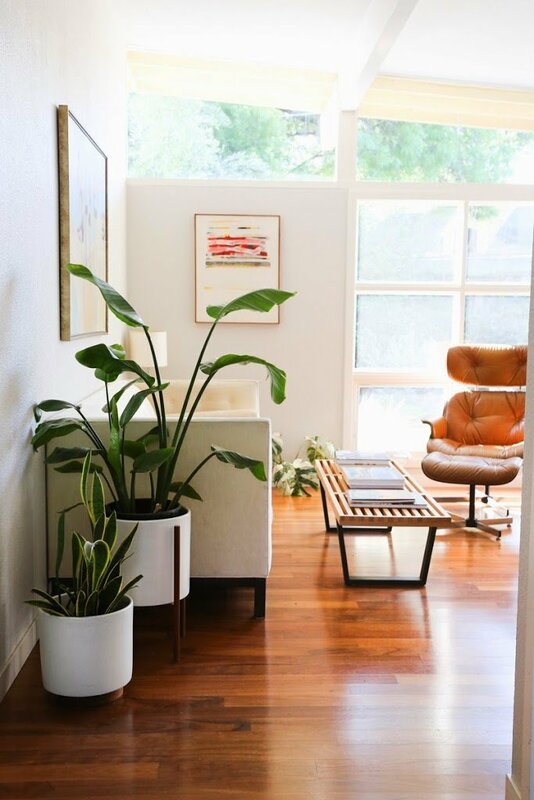 I love the case study Modernica planter with the wood stand and was wondering if it’s the small or the large one? Thanks for your help. 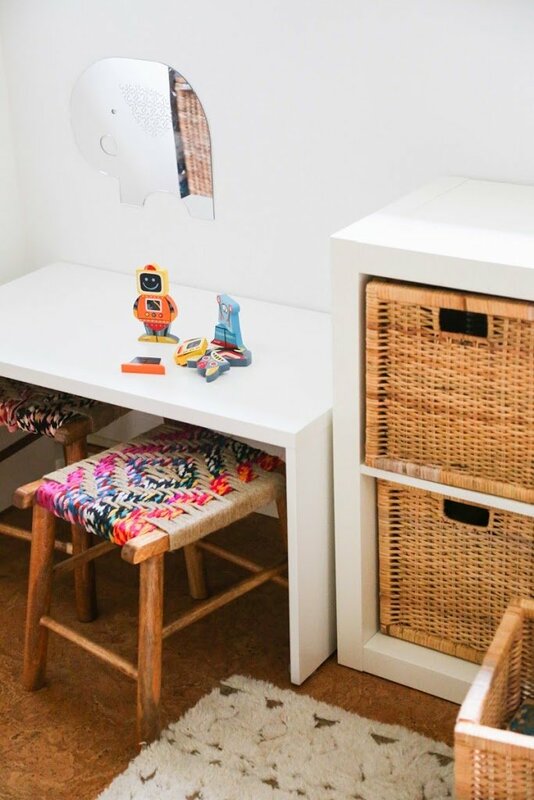 Love the white lacquer storage credenzas in the nursery, where are they from ??!! Wow what a lovely home. I have never seen this type of home in my life. Thanks for sharing this beautiful post with us. Everyone has a dream that how they will decorate their own home with beautiful furniture and home bars. Oh! your post is mind blowing. I like it. Thanks a lot for your great shearing. your site is one of the best site among the all of mobile related site. Thanks again. Loved this! I’ve followed Ashley’s blog for years — she’s got such great taste and way of life. Their home is amazing. Thanks for sharing! I enjoy your photos and can’t stand to pin it on my board in pinterest. 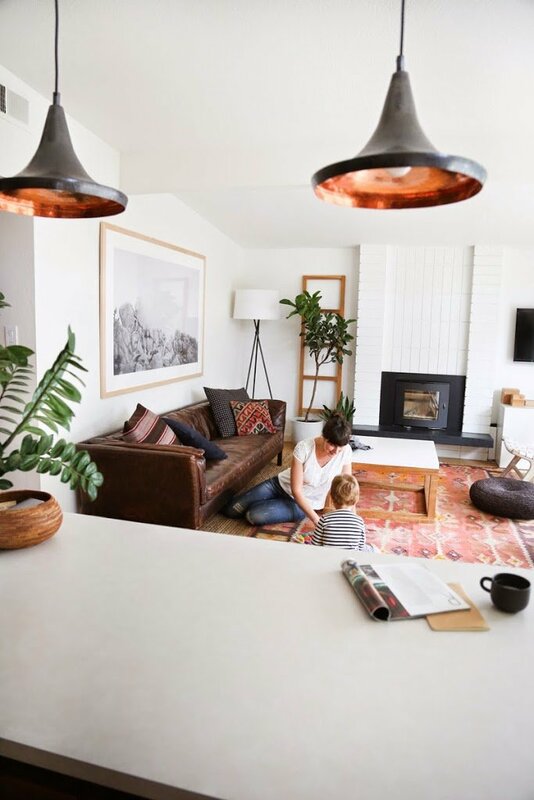 Oh geez, I lost track of your blog many months ago and I’m thrilled to see your home in Davis has come together so beautifully and that your lovely family has grown! You did an amazing job with this post! 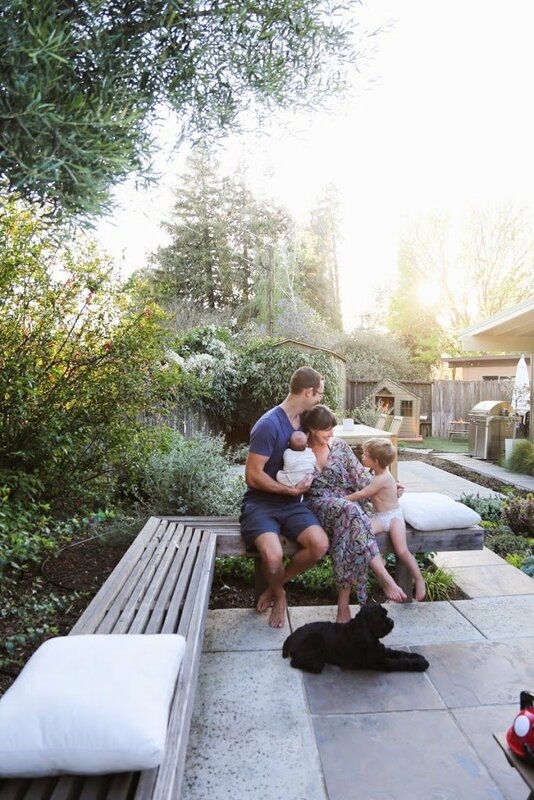 What an amazing place this couple has–a perfect spot to raise children and relax without having to travel elsewhere. Looks like a great life. Okay, wow! That is the house I need. Hey, I live in Davis too! It’s a beautiful town, and is the perfect juxtaposition of college-y and family-friendly (with a strong hippie vibe). 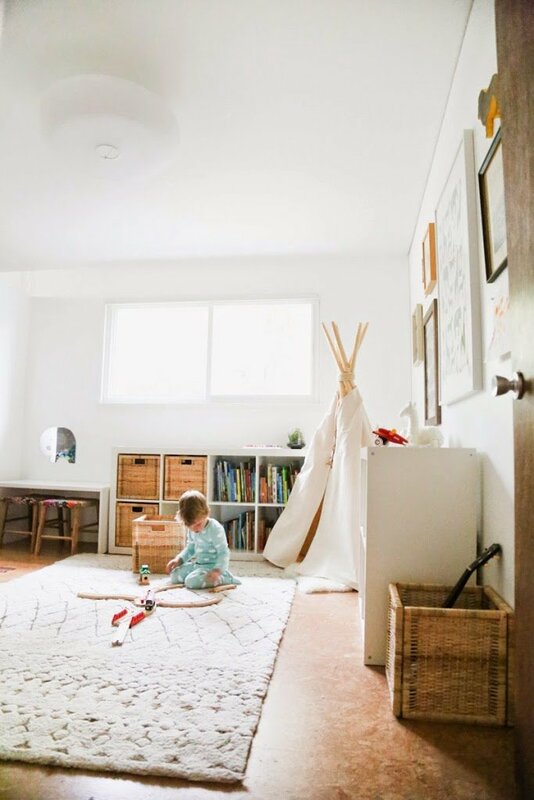 I’m so happy to see it featured on your blog, and their home is lovely! Fun fact: Davis is also considered one of the most bicycle-friendly cities in the world! 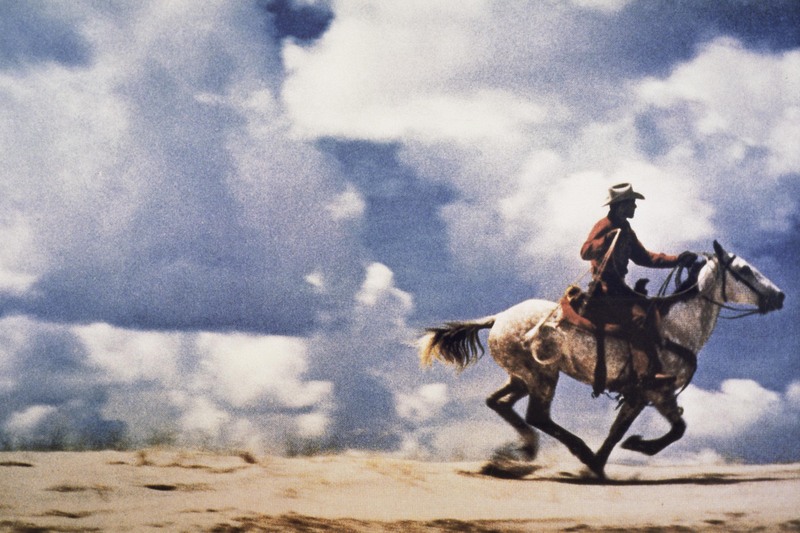 Hi Ashley – do you know where one can purchase Josh Stanley’s photo of Richard Prince’s Marlboro cowboy? It’s stunning! Thanks! @Tabitha–I’d love to learn about that painting over the white sofa, too. We bought it at a Davis estate sale and the belief is that the painter studied at Davis (with Wayne Thiebaud), but they weren’t sure. @two pounds–the map is a topographic US map (but oddly missing Hawaii and Alaska) from School House Electric. @Pear and @Rafiks777–see answer above regarding the cowboy print. 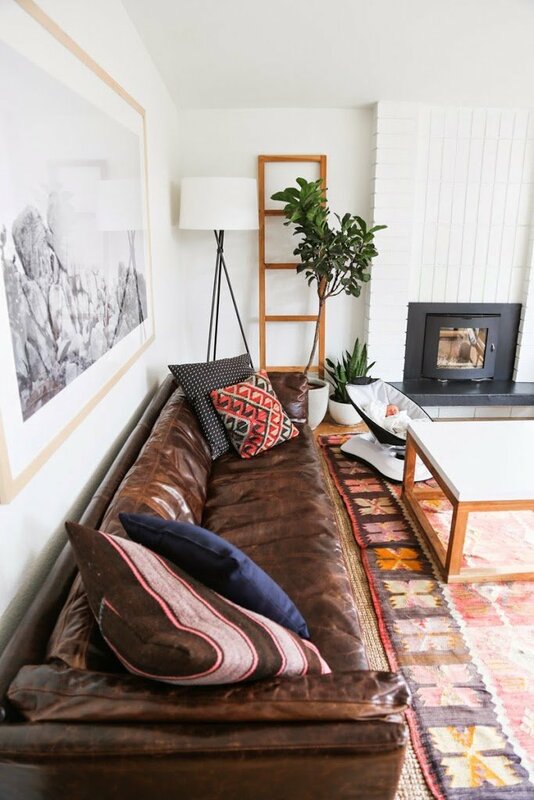 The photo above the leather couch is by Jamie Street. She shared it on Instagram and it’s printed inexpensively on blueprint printer. The framing, however, is not cheap–but there’s a local shop here that had large frames made (they’re around 70×30 or 40 inches) and then used a lighter alternative to glass so they wouldn’t weigh a ton. Lots of light reflection is only downside to the plexi. @Rafiks777–the corner floor lamp is from Room & Board, but I know the one you speak of at Target. We wanted to order it and see if it would be right for another room, but they won’t sell it in California because it doesn’t take the efficient lightbulbs the state requires! @Gosia–Such a pretty book! Excited to look at it more. No stylist or borrowed props in this case. All ours. Thanks! I love everything! Can you please tell me what kind of floors are in the kitchen and what type of hardwood is in the dinning room/bedroom? I am looking for something similar and it looks perfect. Thank you! so nice to see the book MAPS, its by a couple of Poles, my kids have it (in our native Polish) and absolutely love it! Beautiful pictures, plenty of interesting bits on various countries: what’s more to love! I didn’t know there’s a version in English too. ps. the house is a beauty! Are all the pieces the family’s belongings or was the house styled up a bit before the photo session? I just moved away from Davis after finishing my graduate degree. I miss Northern California and can’t wait to get back. Also, it is true, the people at the Nugget are the nicest of any grocery store I have ever been. I miss their cheese selection and juice bar. Hi! I love LOVEEE your beautiful home! Could you tell where did you get all these huge frames and art pieces you have? Also, Is that floor lamp in the corner from Target? I would do ANYTHING for that bed. That headboard?! Oh my gahhhhd. This house is dreamy. Makes me miss California, pool parties, and enjoying a backyard. 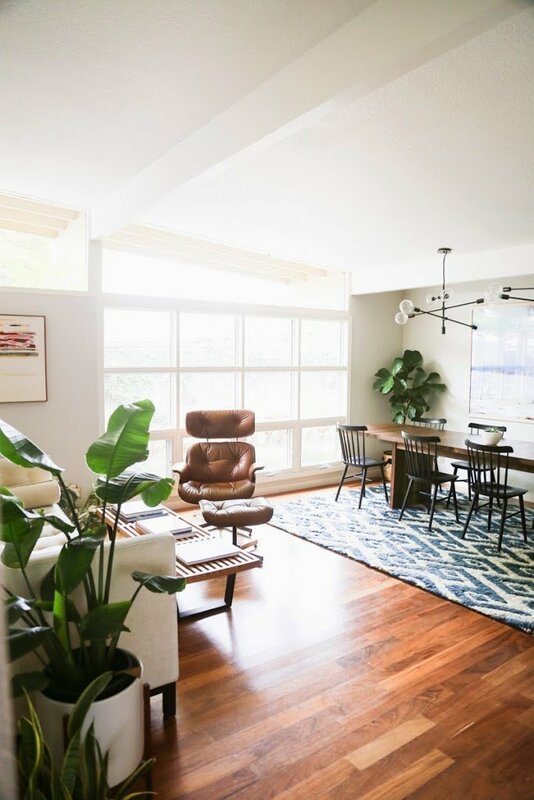 I follow Ashley on IG and have been hoping for a whole-house tour! This is exactly how I imagine every home in California to look, haha. Really not my personal style, but I find it still very beautiful and inspirational. Just wanted to pop in and say that I am almost positive the teepee pictured is from our shop “House Inhabit” on Etsy. We were delighted to see it here, in this beautiful home and hoped the link might be corrected to link our shop to anyone interested. Thanks so much! The whole home tour is a dream. That cowboy is a Richard Prince Marlboro Man, it’s great, isn’t it! Where is the art from? Love the large cowboy piece. i keep coming back to look at these lovely images. i had a couple of them pinned before and now it makes sense that they are all in the same house. anyway, this house is the epitome of what my style is in my head, if i could ever achieve it in reality! well done to them and now i’m off to check out her blog! Absolutely gorgeous! I want every part of that home! My dream home! What an amazing, relaxing and inspiring space. I’d love to know where to find the beautiful map that hangs over Hudson’s bed. Thanks! It would be wonderful if she could do a guest post on how to go about shopping for furniture abroad. What a great idea, but I would have no idea how to do it! oh yay! i love her blog! my husband and i are talking about moving to northern cali and i’ve been following her blog for a while just for the inspiration to go to awesome places. so nice, love their home. Beautiful! I grew up and live(ed) in Davis. Great little town. That house is very Davis, I love it! I looooove Hither & Thither – I just think they’re perfect. I think what I like most about them is that they KNOW GOOD FOOD. I likes me people that know how to eat! Beautiful home..love the modern look & decor!! Oh my gawd the best house ever! Why aren’t you moving to California ?!?!!? Sounds blissful. Great home! Love all the windows. I sure it has great view with all those windows. Holy heck! Is it Neutra? I got the joy of housesitting/subletting at a professor’s house and his dad had worked with many famous architects. I spent the summer poring over “The Complete Works of Neutra.” ADORE this house…thanks for sharing! Beautiful! I’m a big fan of Hither & Thither and this post is awesome. Wow, what an amazing home! The outside yard area is incredible too. if anyone ever asks me to describe my perfectly ideal dream house, i’ll just show them these photos…. simply stunning….im in awe! This house is a dream! I love mid-century houses like this with the triangular windows at the top. Lots of light! Thanks for sharing! Thanks again! And love hearing from so many fans of Davis! @Zoby-Check the Seminyak post in the linked Bali travelogue on my site. I tried to talk a bit about where we shopped there or in the comments there. Wish I’d kept a better list. @lauren.willauer–I believe the common name is Potato vine. It’s awesome. Fast-growing, hardy, and flowers year-round. @Elle–We understand it to be a sustainable, fast-growing hardwood called Suar (Saman) and we hope we did a good job making an ethical purchase. I checked the Wood Database & it’s not listed as threatened (as much old growth is). @Megan/13bees–Thank you! Nice to hear! It all looks so cozy and homey – like a great place to live and grow up. 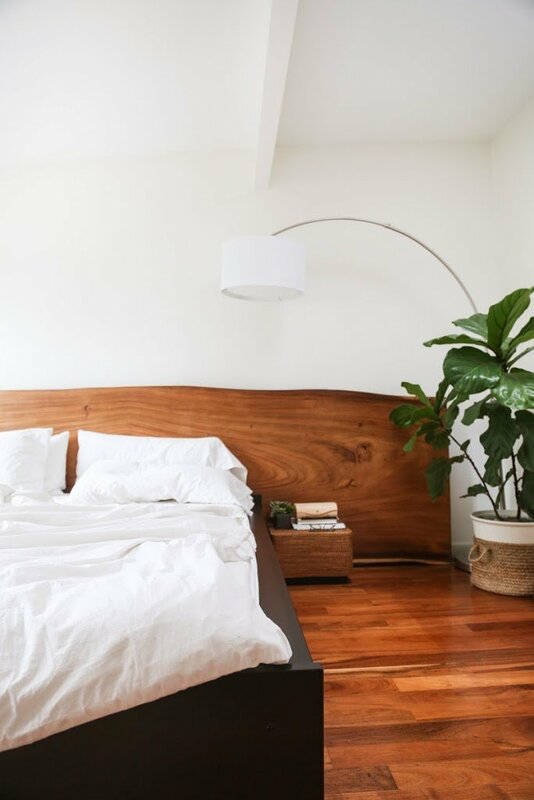 Except for the headboard…I think I’d have nightmares sleeping next to a slice of the last remaining old growth on Earth, knowing I’d contributed directly by purchasing it. What a shame. No doubt it’s gorgeous, but simply unthinkable. You’re seriously friends with the Hither & Tither lady?! Of course you are. I started following her blog when we moved to Sacramento (almost to Davis) from DC. P.S. I lurve that house of theirs! I love it! So inspiring!! This home is gorgeous! I want to live there. Sigh…this house is so gorgeous I want to cry. This is stunning! Now, i want to move to California. they were so brave to buy a house sight unseen. Totally beautiful. I live in Davis and love it! And I’m currently sitting on my porch with a direct view of the farmers market and pony rides :) Lovely home! I’m from the same area and her house always makes me want to move into my grandma’s empty house and redo it. I’m almost positive they are both Streng homes…maybe even the exact same model! Davis is lovely! I live in Sacramento, just up the road and love love love it. After spending a few years on the East coast, there’s nowhere I’d rather be. Living in California, I take the sunshine, space, backyard BBQ’s and beautiful landscape for granted sometimes! Davis is a fantastic family town and their farmer’s market is beautiful! I absolutely must know the plant growing outside your master… gorgeous! your home is so beautiful! LEGIT POST! 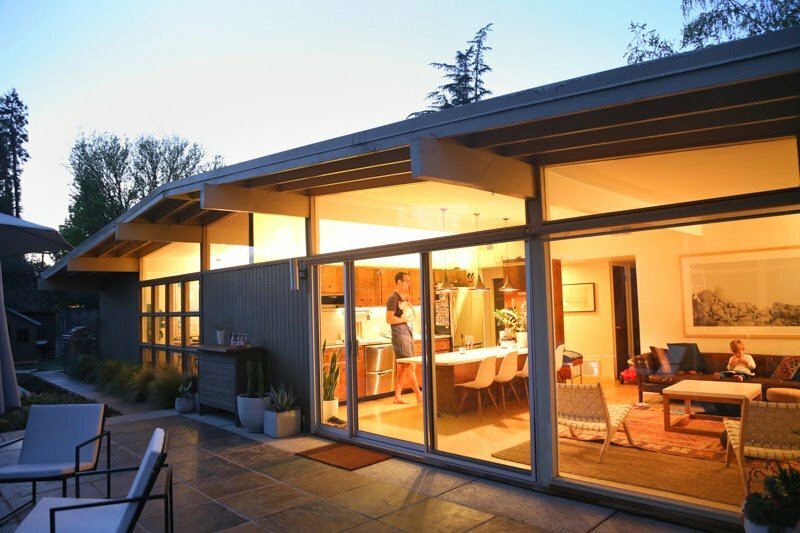 I grew up in an Eichler in Walnut Creek, Ca (and went to school in Davis!) Now I live in the tiniest studio in the Lower East Side with my boyfriend, and though I share your true love for New York City, I miss home intensely and can definitely see your family living very happily in somewhere like Orinda or Lafayette California (where there are also lovely mid century modern homes). Such a lovely home. I went to college in Davis and it’s a great town. I miss the farmers market, especially the kettle corn! Suppliers in Bali pretty pretty please??!!! As an Australian buying from Bali is achievable, buying from US stores is not! Oh, man, now I want to move out to California and have pool/grill out parties with all my friends. So beautiful. Thank you so much, Joanna! And these comments are so nice–thank you!! @Meredith H Conry–the photograph is actually a photo of a famous photo (of an infamous photo). Josh Stanley’s photo of Richard Prince’s photo of the Marlboro cowboy. @Kim–that painting is by Peter Shoemaker. Got it at the Alameda Flea. If anyone knows anything about this CA artist, I’d love to hear! @ shalandarj–Those Snake plants are very hardy and used to drought conditions, so you don’t have to water too much. Those ones have done great in there. You could try rocks at the bottom, under the soil or a slightly smaller plastic insert with a drain hole hidden inside? Good luck! @Augusta Wilson–I wish I had a name. It’s probably a few different ones, we would have to keep going and paint-matching. 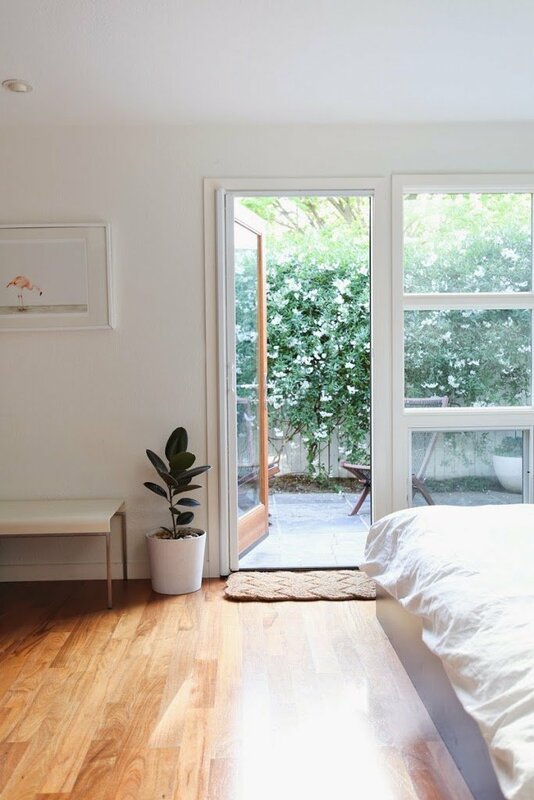 I think Remodelista had a feature on best white paints? What a stunning home. Such beautiful design details, but not overly designed at all. Bravo! I love absolutely everything, well done. Wow, I really love this house. And I remember the crib in a closet tour! So cool to see the wonderful home your friends have made in California. I’m definitely inspired by the nursery and kid’s room. I fell in love with California the first time I visited it…such a lovely place! Wohooo Indonesian proud moments!!! :) I absolutely love Bali! That is basically my dream home. As much as you love NYC, Joanna, all these posts on moving and California… I think you should just do it! I love Aron and Ashley’s blog and looove that you dove into their house today. It is so lovely as is their family. This is so beautiful, Ashley! Love it so much. 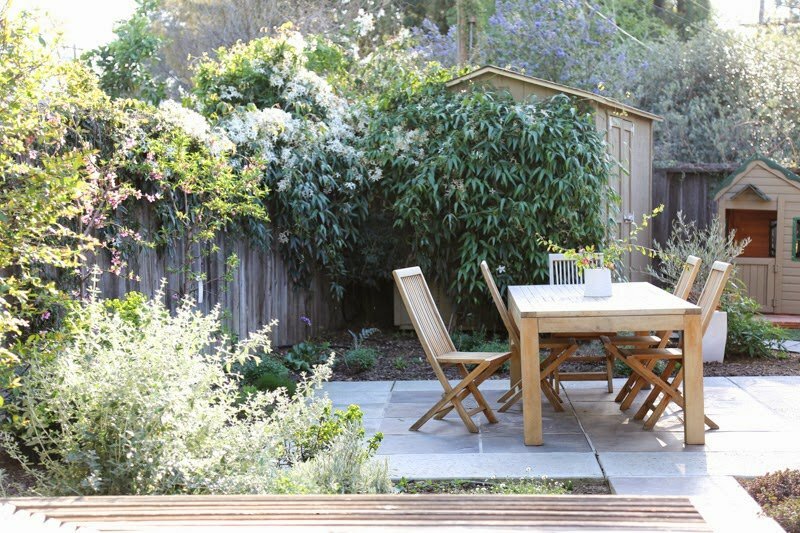 Oh gosh–did you just melt for your backyard after life in the city? So much open space! So gorgeous. love love love. Swooning over this. Thank you for sharing! I love her blog and love her house. Her taste is really lovely. I especially love all the plants. They all look healthy. How does she do it? Oh, and that coffee table. I want it. Wish it weren’t from Bali. Thanks for the awesome house tour. That house is amazing. I would have never guessed it was in Davis, but I guess all of the houses I visited in Davis were inhabited by students! What a beautiful home! Makes me want to move to California too…. Ashley and Aron’s home is beyond gorgeous. I love reading Hither & Thither and it’s fun to see all the pictures of their beautiful home in one place. They have such wonderful taste! 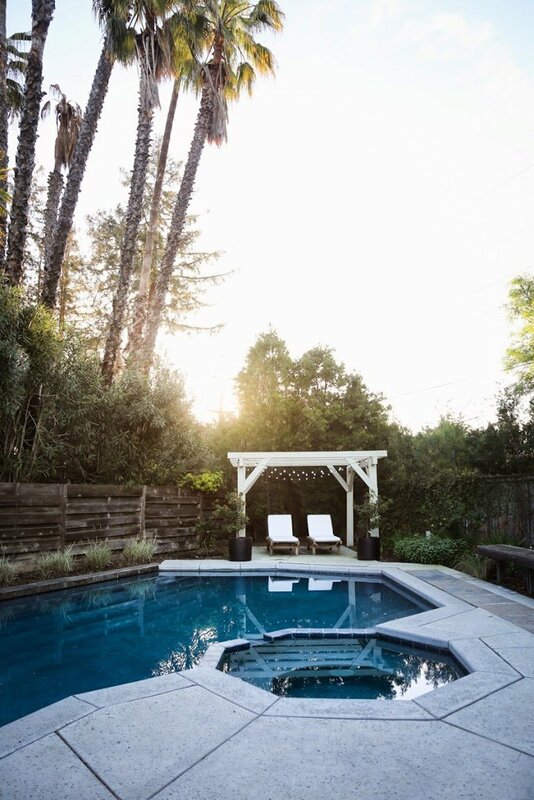 As someone who has only lived in the Midwest and East coast, I look at the palm trees behind their pool and just sigh… the vegetation is so different in California and someday I would love that change of scenery myself :) It seems like a great place to live. ps. : I think you are unconsciously trying to move to California..l lol. What a beautiful home! This is exactly what I am hoping for when we get our own home. Davis is incredible, the pace of life is definitely much slower and toned-down than that of a city, and the markets and friendly atmosphere are just lovely! I live in Davis and love it, I am so excited to see this post! This lovely home is SO Davis :-) I really agree with them that when I moved here I anticipated needing to leave to visit the Bay to be entertained, however I never want to leave or move! Totally agree that a weekend in my (much less nice) little house and garden feel like an adventure. If Ashley or Aron are reading this – I have been dying over those modernica planters for a while but… no drain hole?! Have you been successful with all types of plants in the planters? Any advice on hardier types? I have had the worst luck with pots with no drain holes… would love the feedback! These spaces are gorgeous. I love the idea of going to a foreign country to buy furniture. Talk about a story piece. I think this house is one of the most coolest houses I have ever seen!! If they ever need a housesitter…I am always free!! 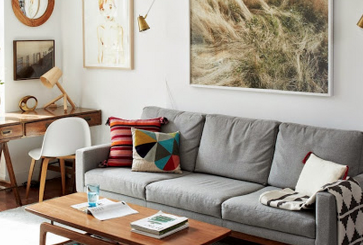 I would love to find out about the white and red/pinkish art between the white sofa and Eames chair. Oh my goodness, I love this home SO much! I’ve always said if I win the lottery, I’d move to California. Seeing this lovely home is making me want to move there even more. Inspirational! Love the simple, paired-down, electric mix of styles! Doesn’t look too-over-designed. 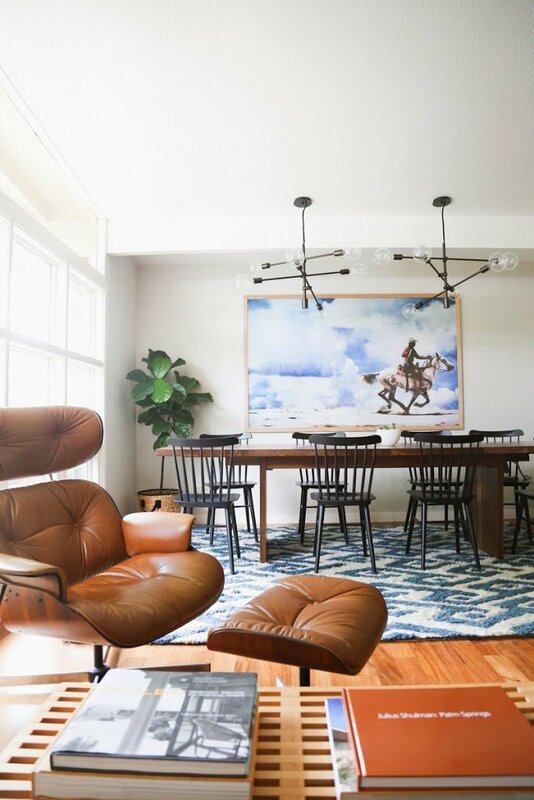 Where did your friend get the photograph/painting of the cowboy/clouds in her dining room? Love it! Want it! 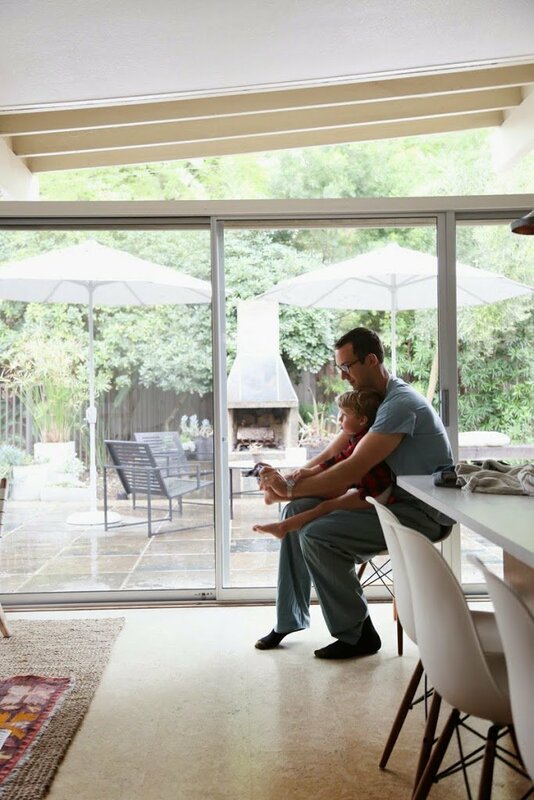 I grew up in an Eichler home like this. In the 50s and 60s he was on a building spree in the Bay Area. I think Steve Jobs grew up in one too! They are lovely and so iconic! The characteristic feature is that the back of the house is always floor-to-ceiling glass. 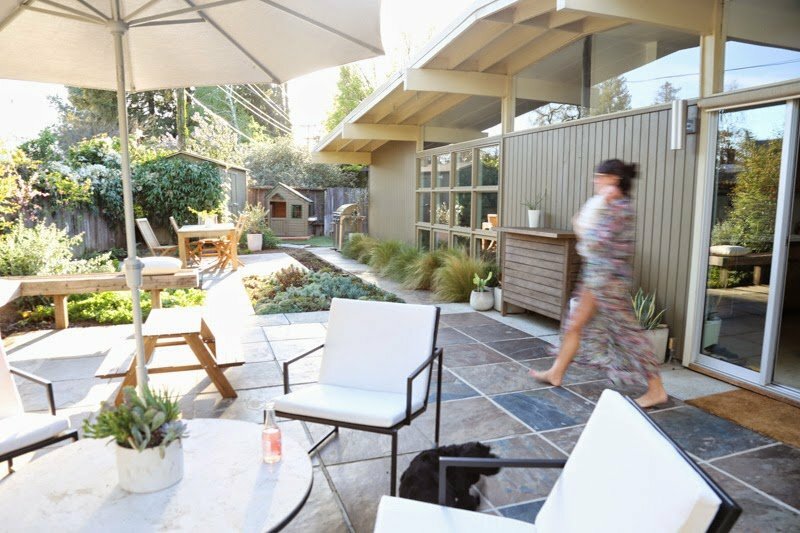 He wanted these homes to feel like the outdoors were an extension of the house. Lovely, lovely home. The divine artworks sit beautifully in the house. I wondered if the baby’s name had anything to do with….Breaking Bad? Sorry, had to ask! Beautiful! When can I move it? !